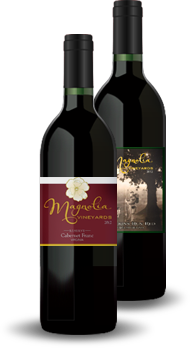 Magnolia Vineyards - Tasting room open Fri - Sun 11:30-5:30! Tasting room open Fri - Sun 11:30-5:30! Magnolia Vineyards, located in scenic and beautiful Amissville, Va, in Rappahannock County is officially Virgina's 251st Winery! Our first planting, consisting of 3 acres, occurred in 2009 with the first harvest 3 seasons later in 2011 producing a limited run of 100 cases. We have since expanded to 7 acres under vine and grow Cabernet Franc, Petit Verdot, Cabernet Sauvignon, Viognier, Sangiovese and Merlot. We plan to continue to expand our planting & production over the years. We offer a carefully selected variety of Olde World wines prepared in classic European style while endeavoring to adhere to modern sustainable agricultural and production practices. Located in Rappahannock County and nicknamed "Winery 251", we are a true Mom & Pop Vineyard and Winery, our cozy, classic farmhouse style tasting room is open to the public for tastings Saturdays & Sundays from 11:30 - 5:30. Glenn & Tina invite everyone to read their story or, better yet, visit them in the beautiful countryside of Amissville, VA, where you can enjoy the tasting room or grounds with views of the Blue Ridge mountains and they'll gladly regale all with their story in person! 04/01/2019 April Wine of the Month - our 2015 Viognier Join us in bidding a final farewell to this wonderful white wine, so soon to be replaced in our tasting lineup with the 2017 vintage! With melon and honey on the nose, pink grapefruit on the forward palate, and a smooth citrus and buttery finish with hints of toffee. 10% off bottle purchases, while supplies last! You can email us any questions, requests for information or to join our mailing list at: info@magnoliavineyards.com or call the winery at 703.785.8190!